The Strawberry Salmorejo with Olive Oil Caviar is a molecular gastronomy dish by Chef Artur Martinez from Capritx (1 Michelin Star) in Spain. Salmorejo, typical dish from Cordoba in the south of Spain, is similar to a traditional tomato gazpacho but richer and smoother. 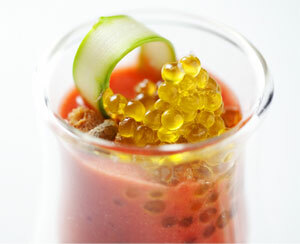 In this recipe, strawberries are used instead of tomatoes to create a unique dish that it is then topped with Caviaroli olive oil caviar to add a magical touch. 1- Wash the strawberries, cut them in quarters and place them in the fridge in a covered container for 24 hours. 2- Process strawberries with the rest of the ingredients in a food processor until smooth. 3- Pass mixture through a fine sieve. 4- Add vinegar and salt if necessary and keep in the fridge until serving. It needs to be really cold before serving so allow for a few hours in the fridge before serving. 1- Process the basil with the olive oil until smooth. 2- Mix the basil oil with the rest of the ingredients and reserve. 1- In the bottom of a glass, place a base of the strawberry brunoise making sure you do not touch the sides of the glass. 2- Taking the same care, cover with strawberry salmorejo. 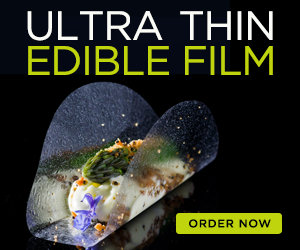 3- Finish with a ribbon of asparagus, a spoon of Caviaroli olive oil caviar, croutons and a pinch of salt flakes. 4- Serve immediately before it gets warm.